Each ml solution contains 250 mcg of Ipratropium Bromide BP. Ipratropium Bromide is a quaternary ammonium compound with anticholinergic properties. It appears to inhibit vagal reflexes by antagonising the action of acetylcholine (the transmitter agent released from the vagus nerve). Anticholinergics prevent the increase in intracellular concentration of cyclic guanosine monophosphate (cyclic GMP) caused by interaction of acetylcholine with the muscarinic receptor on bronchial smooth muscle. 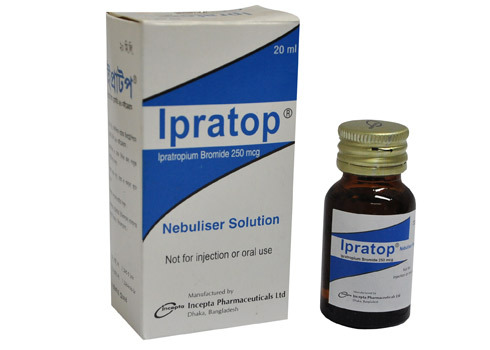 Ipratop Nebuliser Solution is indicated as a bronchodilator for maintenance treatment of bronchospasm associated with chronic obstructive pulmonary disease, including chronic bronchitis and emphysema. Children over 3 years: The usual dose is 0.4-2.0 ml Ipratropium Bromide Solution (100-500 micrograms) up to three times daily. Adults (including elderly and adolescents) over 12 years of age: The usual dose is 0.4-2.0 ml Ipratropium Bromide Solution (100-500 micrograms) up to four times daily. Allergic-type reactions such as skin rash, angio-oedema of the tongue, lips and face, urticaria (including giant urticaria), laryngospasm and anaphylactic reactions have been reported, with positive rechallenge in some cases. Ipratropium Bromide should be used with caution in patients predisposed to narrow-angle glaucoma, or with prostatic hyperplasia or bladder-neck obstruction. The safety of Ipratropium Bromide during human pregnancy has not been established. The benefits of using Ipratropium Bromide during a confirmed or suspected pregnancy must be weighed against possible hazards to the unborn child. It is not known whether Ipratropium Bromide is excreted into breast milk.